Hillary Clinton still holds a double-digit national lead over Bernie Sanders after a close contest in Iowa last week, new polling shows. And in addition to maintaining her lead, an overwhelming number of Democratic voters believe she will win her party’s nomination. Clinton leads Sanders by 12 points — 51 percent to 39 percent among Democratic and Democratic-leaning voters across the country. These numbers are according to the latest NBC News|SurveyMonkey Weekly Election Tracking poll, conducted online February 1, 2016 through February 7, 2016 among a national sample of 10,707 adults aged 18 and over, including 9,484 who say they are registered to vote. 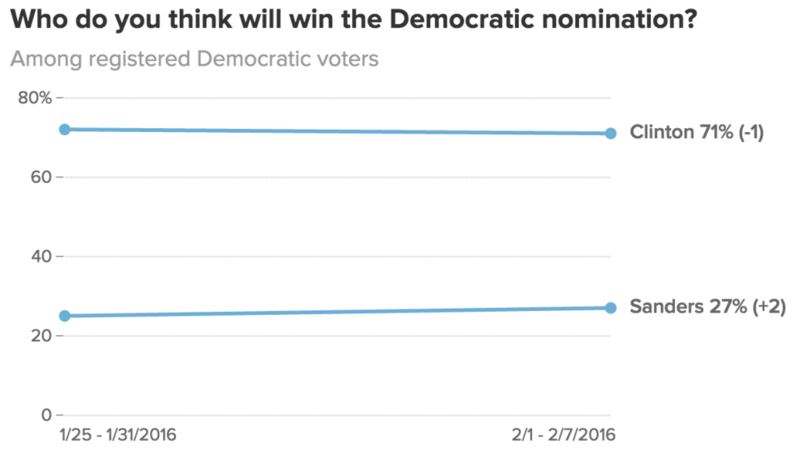 Clinton also remains the clear front-runner to win the nomination, according to Democratic and Democratic-leaning voters. 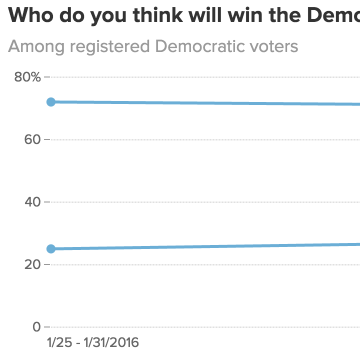 Last week, in the final days leading up to the Iowa caucus, 72 percent of Democrats said that regardless of whom they supported in their state’s primary or caucus, Clinton would be the eventual nominee. A quarter said Sanders would win the eventual nomination. 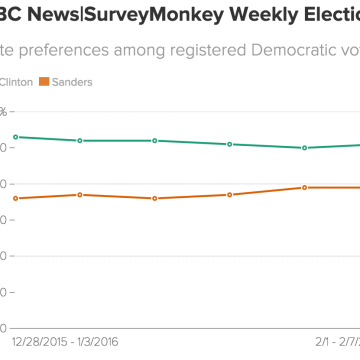 This week, that opinion is largely unchanged after the close contest in Iowa — where Clinton barely edged out Sanders. 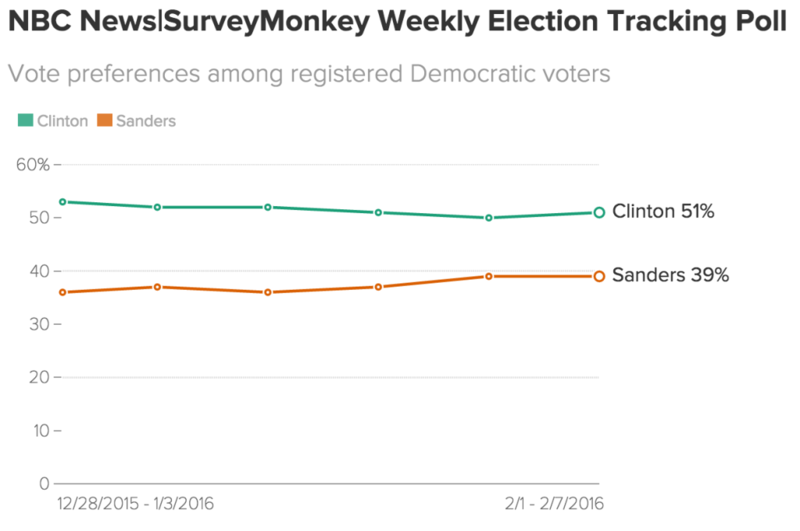 The NBC News|SurveyMonkey Weekly Election Tracking poll was conducted online from February 1, 2016 through February 7, 2016 among a national sample of 10,707 adults aged 18 and over, including 9,690 who say they are registered to vote. Respondents for this non-probability survey were selected from the nearly three million people who take surveys on the SurveyMonkey platform each day. Results have an error estimate of plus or minus 1.4 percentage points. A full description of our methodology and the poll can be found here.